Planet 47, Centre for Down Syndrome and Youth Hostel, offers you a stay in a beautiful Istrian stone house from the 17th century that was restored with organic materials in recent years. It contains four bedrooms (twelve beds all together), small kitchen, dining room and large bathroom with two toilets and two showers. One room is adapted for wheelchair and has its own bathroom (toilet, washbasin and shower). Next to living quarters stands a 60m2 hall built entirely from organic materials (clay, wood, sheep wool, hemp, stone). It has a high ceiling and its own toilets. A professional kitchen with a wood-burning oven is also a part of the complex. In this kitchen it is possible to prepare meals for up to 60 people. Close to accommodation spaces, there is a proper Finnish sauna heated with wood. 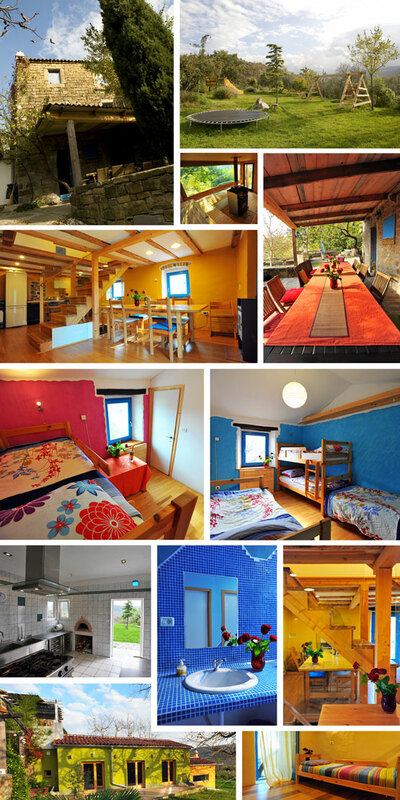 It has one big glass wall that offers a wonderful view of the valley of the Dragonja River. Sauna can take in up to 15 people at a time. Unspoiled nature of the upper Dragonja river basin offers you many opportunities for walking, trekking and cycling. Hostel is located in the ecological village, which allows you a pleasant stay in a healthy, natural and peaceful environment. Nights are quiet and observing the stars is not hindered by light as there’s no street lighting in the village. Centre is basically intended for families of children with Down syndrome, but when we are not carrying out our educational programmes, it can be rented in its entirety. It can accommodate groups of up to 15 people. The place is especially delightful for lovers of nature, ecology and positive energy who devote to sports, artistic expression and spiritual activities, which all need peace and quite, and a healthy environment. The complex is particularly suitable for children for whom we have set up wooden playground equipment in the Planet 47 Park. Distance from the sea is 15 km (25 minutes by car), but only 15 minutes walk separates us from Dragonja river. In the summer, you can swim in it because it is clear enough even for river crayfish to live in it. It is a little colder, though, but so much more refreshing. All profit from rent is used for co-financing our Leonardo da Vinci Special Programme.